I have a confession to make: I shoplift malted milk balls. Okay, maybe not actually steal, but every time I go into the grocery store, I immediately head straight towards the giant bins of mix-and-match bulk candy. I take my time in examining my options, but my hand always dips into the bin of chocolate-covered malted milk balls that I've loved since my childhood. I mean, hey, you have to taste before you buy, right?! Given my love for malted milk balls, baking with them was clearly the next step. This time, I actually purchased them! 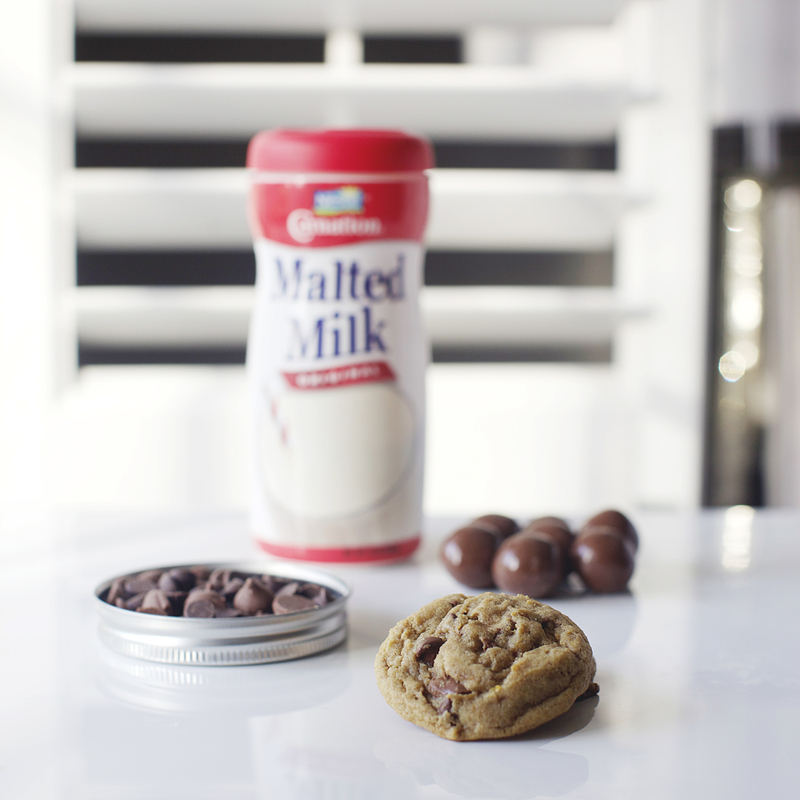 This recipe spices up a traditional chocolate chip cookie by adding crushed malted milk balls and a hefty serving of malted milk powder to the mix. The result is a perfectly fluffy cookie teeming chocolate malt flavor. Actual perfection. My one tip: add a swirl of chocolate syrup to the batter to take them to the next level. Preheat oven to 350 F. Line a baking sheeting with parchment paper. In the bowl of a stand mixer fitted with the paddle attachment, cream the butter and sugars until light and fluffy, about 3 minutes. MIx in the egg and vanilla. Slowly add the dry ingredients and mixed until combined. Fold in chocolate chips and chopped malted milk balls. Scoop tablespoon-sized balls of cookie dough onto the prepared baking sheet. Bake cookies for 10 minutes. Cool and enjoy!